The Indo-Tibetan Border Police (ITBP), which has ten battalions posted in Arunachal Pradesh, has offered to provide pre-recruitment training to local youths at its headquarters across the state. Director General (DG) R K Pachnanda, who called on Chief Minister Pema Khandu today, said such pre-recruitment training will equip local youths with basic physical fitness required for qualifying in recruitments by the force. He also said ITBP is willing to offer its services like medical and health camps in border areas of the state at regular intervals. He proposed that a health mela be conducted by the ITBP at a large scale that may be inaugurated by the Chief Minister or the Health Minister. Khandu expressed gratitude to the DG for his intent to serve the people of Arunachal Pradesh and offer the services of the force for welfare measures. He appreciated the offer to provide pre-recruitment training to local youths and assured to take up the coordination part in the meeting with the deputy commissioners scheduled in the second week of June. 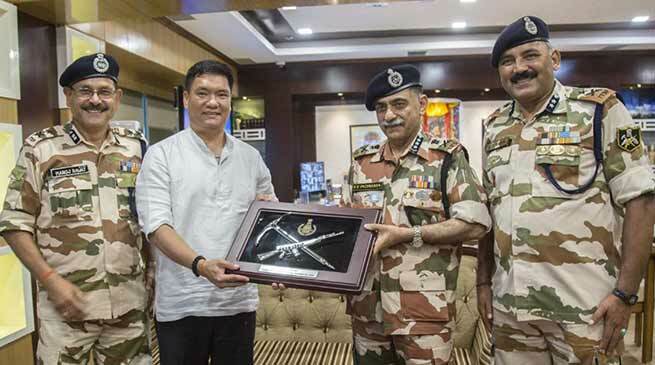 Reiterating his request for creation of two new battalions exclusively of local Arunachalee youths, Khandu sought cooperation and pursuance of the DG. He asserted that local youths are physically as well as mentally acclimatized to the difficult terrains and topography of the region. As ITBP is a specialized mountain force, he said youths of the state would be best suited for the job. “Add to it the immense level of patriotism embedded in our people,” he pointed. Pachnanda, who is visiting border outposts in the state, assured his commitment to the proposal and said that it was in fact under process. He requested the state government to pursue with the Union Home Ministry as ITBP would be more than happy to have any number of battalions consisting exclusively of local youths from the home state. Till the time such exclusive battalions are created, he said pre-recruitment trainings would enable more and more of local youths to get employed in the force. The DG further informed that the 10-bedded hospital at Kimin is being upgraded to also cater to civilian populace till a full-fledged hospital comes up at the Yupia ITBP premises. Pachnanda said that the central paramilitary force has been conducting excursions for school students and sporting activities. He said the recent friendship football tournament conducted for the border areas was a huge success with 76 matches played and suggested that ITBP could nurture children in sports like football, martial arts, mountaineering, etc. The ITBP top boss, who was accompanied by IG (Ops) S S Hartha and IG (NE) M S Rawat, will visit the Tawang Sector tomorrow. This morning he visited Bhalukpong, Kimin and Yupia.